We got hands-on with Koei Tecmo's Attack on Titan 2 at a recent press event and had an opportunity to briefly speak with Hisashi Koinuma, President & COO of KOEI TECMO Games and Producer for Attack on Titan 2, about the title and the changes players can expect from the first game. Co-Optimus: Can you tell us a little about Attack on Titan 2 and how it's different from the first game? Koinuma: The main differences are Attack on Titan covers the stories that include Season 2 of the anime, you can create your own original character [and play through the story], and the number of playable characters has been expanded from 10 to over 30. Also, there is more interaction with all of the characters via the "Town Life" system. Finally, the online capabilities are further expanded [to include co-op play in the campaign]. 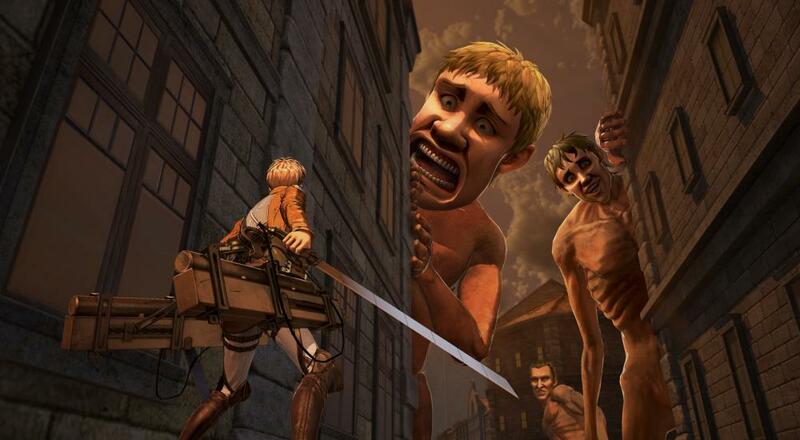 Co-Optimus: The first Attack on Titan game offered a co-op mode that was separate from the main story missions. What lead to the decision to incorporate co-op throughout the story and scout missions for Attack on Titan 2? Koinuma: [With Attack on Titan 2], the Story Mode is much more than what it was in the first game and I think it's more fun playing with others. Co-Optimus: One of the key elements to the anime and manga is how the Titans are so massive and powerful that taking one down requires the coordination of an entire squad. In a video game setting, there's obviously a need to empower the player so they don't feel like taking down a Titan is an impossible feat. How did you go about balancing these two ideas within the game? Koinuma: I think really savvy gamers can do whatever they want to and still enjoy the game, but compared to the original game, Attack on Titan 2's increased cooperative functionality [with co-op in the Story Mode] together with better interactions with the [A.I. controlled] Allies [makes for a better co-op experience]. You also have more options than before about how to upgrade weapons and the Omni-Directional system, so depending on a player's skill and playstyle, they can choose how they want to play. Co-Optimus: Are there any bonus abilities or benefits given to players by teaming up with their friends instead of A.I., such as special combo attacks or resupplying one another? Koinuma: If you play with another person, it's easier to accomplish the mission [laughs]... but there aren't any special abilities [like supplying one another]. However, if you're captured by a Titan and trying to break free, a friend can attack that Titan and help free you. Our thanks to Hisashi Koinuma for taking the time to speak with us and answer our questions. Be sure to check back in tomorrow for some hands-on impressions of the game! Page created in 0.9834 seconds.